THE NATURAL HAVEN: Coconut oil + Olive Oil = Mixed Micelles? Coconut oil + Olive Oil = Mixed Micelles? 'It’s possible that the olive/coconut oil combination might even penetrate hair better. I won’t bore you with the details, but it has to do with mixed micelles' What are mixed micelles you ask? Hopefully you have stayed with us on the journey about micelles. At a very basic level, there are three parts to a micelle - oil, water and a surfactant. Mixed micelles are micelles with more than one surfactant, therefore at a basic level would consist of oil, water and two surfactants. Mixed micelles are researched in pharmacy for making more effective drugs. (Langmuir, pg 331-341,1985). 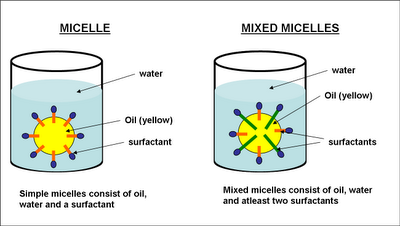 Can two oils mix to make mixed micelles? In my opinion, this doesn't make any chemical sense. Mixing two oils is like mixing two liquids. For example if you mix apple juice and orange juice, you just get a liquid mixture. Just like if you mix olive oil and coconut oil, you just get an oil mixture. To form a micelle, there needs to be a water phase AND a surfactant (remember oil droplet forms with plain water). To form mixed micelles, then we will need two surfactants. I did look for sources to find out if anything has been published to justify the beauty brains statement and I didn't find anything. I would love to see a reference for this statement, I can only say I searched and didn't find anything. Would mixing coconut oil and olive oil make a more penetrating mix? I actually don't disagree with this part but first let me make one more gripe I have with this post clear. The paper cited by the beauty brains which I have quoted here before actually only talks about coconut oil and mineral oil. They didn't do their homework properly on this one. Yes, in case you are wondering, I have actually left a comment on their site directly when I saw their incorrect work referenced on two other blogs. Yes this is a possibility, just not through mixed micelles. I think an alternative theory is the 'free energy' theory . In chemistry, it is a general rule that everything tries to have as low an energy as possible. It is possible that part of the reason why coconut oil will combine with olive oil is because the combination has a lower energy than coconut oil or olive oil on their own. A lower energy would perhaps allow the oil to penetrate easily as it will receive less resistance as it tries to squeeeze under the cuticle. What other mixtures would work? Coconut oil is the only oil which has actually been 'seen' inside the hair. 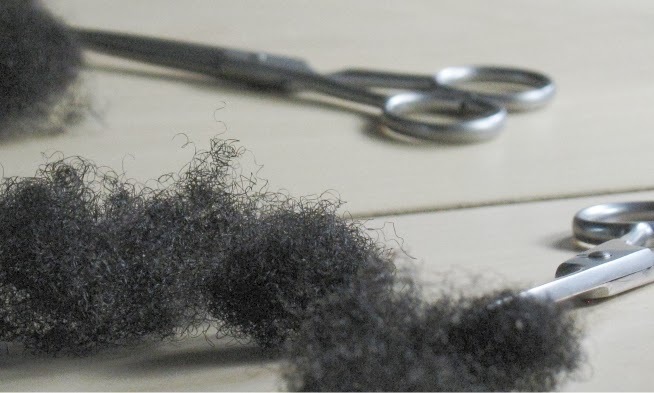 There are theories that other oils which contain saturated fat are probably able to penetrate hair (because the bonds in the saturated fat can move easily). Therefore I would probably rate avocado oil higher than olive oil. Possibly a coconut/avocado oil mix? Again though this is a theory........! In conclusion, I do actually love the beauty brains, this is why I have them as one of my links. I would actually say that this is the only post on their site which irritates me because it is innaccurate. I would love for them to do the correct scientific thing and simply acknowledge it is wrong and either fix it or delete it. I do still read their site regularly and I like their writing. Very interesting! I swear by my olicoco oil (olive and coconut oil). I used to use avocado oil all the time. It might be time to revisit it based off of your thoughts on mixing coconut and avocado oil. Thanks for sharing. Olicoco that's a clever name! lol @ Olicoco! it is indeed a clever name. Very enlightening post too. Great info. I love your blog. I never thought of myself as a "science-geek" but I think you are bringing it out of me. Thank you, JC, for another informative post! Hi Zaine - a 50-50 mix was suggested. Welcome to the natural world!! I was very intrigued by the idea that the coconut-olive oil mixture might be able to penetrate the hair shaft more readily. If doubling up on 'penetrating' oils enhances this attribute, what happens if a 'penetrating' oil is added to a sealant (like jojoba oil)? Does the sealant impair the 'penetrating' oil's ability to penetrate the shaft? Great question anonymous. Unfortunately this one can only be resolved by an experiment. From my own understanding I would say probably not because the hindrance to getting into the shaft will come from competition. Since the sealing oil is not trying to squeeze through the cuticles, then perhaps the penetrating oil will have no competition. However if you throw something like water into the mix then it is almost certain to me that water would get through before the oil because the water molecule is smaller and faster moving. I agree. I am relaxed and since ive learned to take care of my hair it is thick, healthy, shiny and strong with very little shedding. I am retaining 1 inch per 2 months and stretching my relaxers. I ONLY use my natural oils, wrap every night, satin pillow case, wash and deep condition regularly. I LOVE my natural oils! i mix olive coconut,sweet almond and castor oil and use it on my scalp and ends at night it works ok for my i'm thinking of dropping the sweet almond oil though because it doesn't seem to have any benefits.what do you think? i mix coconut, avacodo and jojoba oil...is that alright??? I started to mix coconut oil and olive oil not because the BeautyBrains had said it was any good but because the coconut oil that I have is hard at room temperature in the winter. It's good to know that there may be an added benefit to it. Hi JC im Adonz from Philippines upon reading all these gives me bright ideas, I was thinking of mixing Coconut oil,Extra Virgin olive oil,Moringa oil and Sunflower oil which is abundant in our country and temperature in here is not a problem,would there be any effect on mixing 4 oils together? will it give any harm if somebody would ingest it? can my mixture be a tool for cure? Mixing olive oil with coconut oil makes the mixture creamier and easier to apply in winter weather.